Discussion in 'Downhill & Freeride' started by IH8Rice, Aug 29, 2012.
might not be DH related but this forum is trolled, i mean viewed, more. Kickass. While it doesn't have much in the ways of bells and whistles, what excites me is the likelihood of reliability. agree'd. and how about those thompson seat clamps, never fail. First thing i thought when i saw it, i know guys that are waiting to buy droppers just because of that. What is mechanism is preventing most manufacturers from doing this? From the Stig: You have to cheese the internals to put the cable at the mid or bottom. Durability first, fashion second. Do want. This will most likely find it's way to my SB66c. I have hesitated buying a dropper post due to reliability, but I would buy this in a heartbeat. "The Elite Dropper's outsourced internals are laser etched at the bottom of the post (left), including the nod to its Norglide bushings and Motul oil. The threaded silver bottom cap (right) allows access to the post's internals, while a specially-shaped plug at its center keeps users from letting the nitrogen gas escape accidentally. " "You have to cheese the internals to put the cable at the mid or bottom. Durability first, fashion second." so we can open it up but not let the nitro out first and once we're in there the actual cart is sealed? That is good enough reason for me, I was just curious. Can't believe nobody else has asked this yet - weight? Robert De Rose In order for the cable to be routed at the bottom, the durability and functionality of the internals would drop. We looked at the different options; and the durability of the cable and it's use in the field was less concerning than the durability and functionality of the internals. The overall systems durability was the driver. So when given the choice of which functional aspect to go with, we choose the cylinder functionality over the cable placement. Their should be a 30.9mm, though the 31.6mm will come out first. Won't be able to make a 27.2mm size as it gets to small to fit all the components in, with the same functional requirements. Also it wouldn't meet the structural requirements at such a small diameter. but there aren't that many LEVs out there as far as I know... I just got one, and I'm hoping it's at least as durable as their other products, but there were no guarantees. It was an expensive leap of faith, I hope it works out. in the mean time, it works AWESOME! 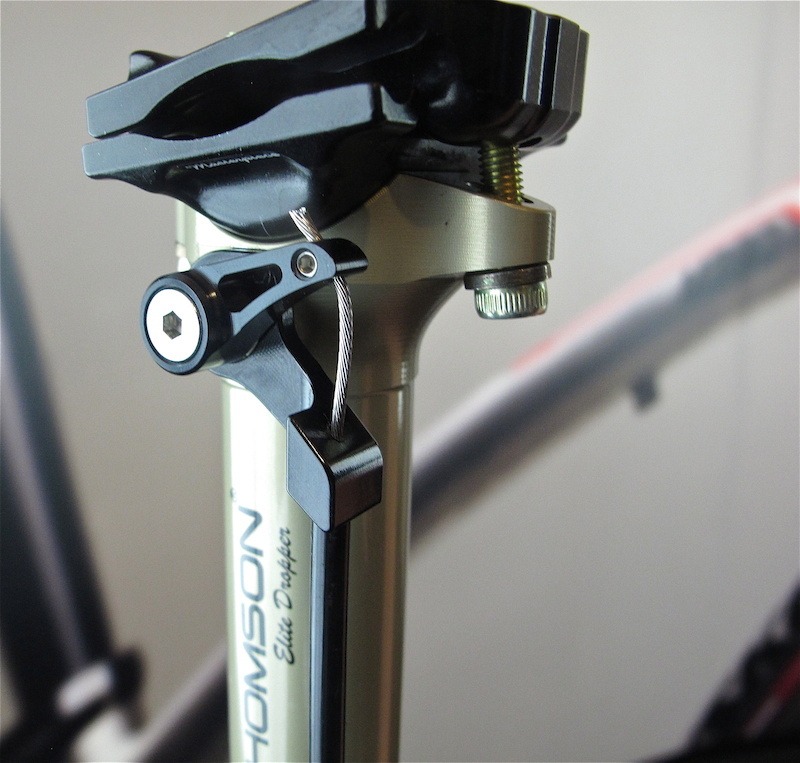 I really like the idea of an integrated dropper post. Normally I view Bionicon as the kid eating glue in the corner of the classroom but their integrated post looks pretty swish. I love my Gravity Dropper. I can't stand how all other dropper posts have a cable that moves up and down with the seat. True. I haven't heard very good reviews about it though. My Gravity Dropper is 2 years old and working perfectly. Electric_City The orangutans are loose! OMG! What the F' were they thinking when they routed that!!! I'm out. I can't buy that just cause of the cable! I'm on a KS 950r for 3 seasons now with no problems whatsoever. I'm not light either (250-285). I run the 950r "backwards" for a little setback. Again, no problems. The cable runs smoothly along the top tube and bends smoothly to follow the post. It's zip tied to the rear brake hose just before the bend. The cable is never in the way and never snags on anything cause your body is in front of it. Even though I love my hydro discs, one less thing to bleed is a plus. You get the best of both worlds- Cable actuated, hydraulic inners. really? that surprises me. Mine works great, and previous KS offerings have proven to be very reliable from what I gather (see above post!). It doesn't win prizes for weight or price, but I'd understood it to be very functional and reliable, which is what I'm after in a post. Time will tell I guess. For me, this cable routing thing is more a problem in theory than practice. I've run gravity droppers, joplins, and reverbs for a long time. It takes maybe one ride to get things routed and from there it's a non-issue for me. I mean I agree that stealth routing or a fixed cable would be cleaner, but it's not a big issue for for me or any of my riding buddies. I am digging the lever on this post (and the Lev). The lever is about the only thing I'm not crazy about on the reverb. Works great but the ergonomics and fit are not super. For me, this cable routing thing is more a problem in theory than practice. Totally agree. The cable is a non-issue with my Reverb and I have never felt it was there or wish it wasn't. I find the cable routing for the derailleurs and rear brake much more annoying as the suspension cycles, but this is frame design-specific (Giant Trance). I'm buying one. I have a great deal of faith in Thompson, and the cable routing don't bother me none, especially since the bottom route won't work on my bike. Any clue as to when these are going to be available to the general public? Just got the new SB66, now I need to blow some more coin on a dropper post. Any clue as to when these are going to be available to the general public? Fourteen days, give or take. i concur. though given an oem situation i'd choose the reverb stealth (for aesthetics more than anything), i've absolutely no issues with my conventional reverb. with appropriate hose routing and length, it's tidy. Gee, i better pipe down, I'm beginning to sound like a shill... plus, I'm not really on-topic. That's it for me... except to reiterate that the Thomson post is one hell of a looker. IMO, obviously the cable at a different spot looks better and may be less annoying, etc, but I think Thomson is a good company and they made choice to go the route they did. I would rather deal with a company that states they did it that way for a reason than ending up having to rebuild it every three months because a different way looks better. I think it is safe to say people are excited about this post because it is likely to be very robust and low maintenance. And, having a cable routing that isn't quite as clean as the KS Lev is an acceptable trade off. It's the flipside of the argument for buying a dropper post with a stationary cable. That being said, the Reverb seems to be pretty refined these days. I put one on my wife's trail bike a couple months ago, and its been problem free so far. I think KS is a Taiwan based company. A quick check of their website gives a California address for "KS USA", while the main company name is listed is KS High Tech, LTD, or something. The ham fists out there are gonna' strip the shti out of that cable clamp bolt/hole. I'm very happy with my two regular hose Reverbs, but if the option to have the hose out at the lower collar area was there, would totally go that route. I can not believe Cannondale didn't come out with that ^^ first. Just tried to order one from my shop. Thomson is saying 6 months.